Divine Light Mission was the brainchild of one man, Satgurudev Shri Hans Ji Maharaj, Guru Maharaj Ji's father. For several decades he traveled across India, from village to village, giving spiritual discourses to small groups of people, and initiating the few sincere seekers of Truth in the Knowledge of God. 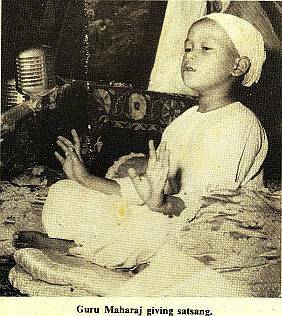 In 1961 Shri Maharaj Ji founded the mission. He sent his mahatmas, close disciples who have been empowered to reveal Knowledge, out into India to spread Truth. Free public programs were organized in every large city. "Dear children of God, why are you weeping?" he asked. "Haven't you learnt the lesson that your master taught you? The Perfect Master never dies. Maharaj Ji is here, among you. Recognize him, obey him, adore him. I have come in this young form to spread this Knowledge to the whole world in my lifetime." From that moment on Guru Maharaj Ji took the reins of DLM and propagation continued. A few years later the first Westerners began to discover Guru Maharaj Ji's ashram near the Himalayas. Typically, they would come to Maharaj Ji. receive the Knowledge and spend a few months practicing meditation and hearing spiritual discourses. Then Maharaj Ji would send them back home to tell their families and friends about the experience. In October 1969 Guru Maharaj Ji sent a mahatma to give Knowledge in the West. Meanwhile he stayed in India and prepared his first world tour. On November 9. 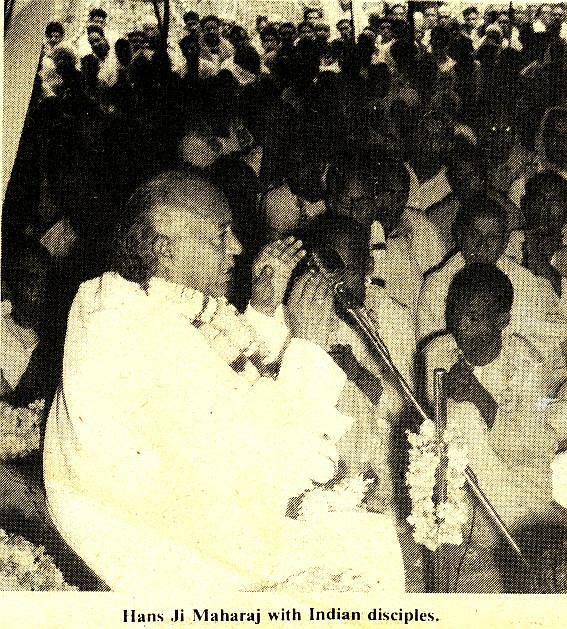 1970, one million people flooded Delhi to hear his message. He declared at this time: "Give me your love and I will give 'you peace. Come to me, I will relieve you of your sufferings. I am the source of peace in this world. All I ask is your love. All I ask is your trust. And what I can give you is such a peace as will never die. 1 declare I will establish peace in this world." Guru Maharaj Ji flew out of India and landed in London in June 1971. One month later he flew to America. Guru Maharaj Ji spent two months in America, speaking in all the major cities. Thousands received Knowledge, and Maharaj Ji requested that the Western devotees charter a jumbo jet and spend two months with him in India during November and December. This experience was so enriching that the Western devotees returned to England and the U.S. and established Divine Light Mission. Devotees turned their apartments and houses into information centers where people could learn about Knowledge and the Perfect Master. By mid 1972 five mahatmas were crisscrossing the U.S. giving Knowledge to those who wanted into the mystery. Guru Maharaj Ji toured South Africa in April and then arrived in America to speak in 10 U.S. cities. In early July, he presided over the first National Convention of DLM in the U.S., and supervised the growth of the Mission. Later that July, the first American public function hosted by DLM took place in Montrose, Colorado. 5,000 people came and heard Maharaj Ji speak. He said at that time, "There is going to be a time coming soon when this world is going to see great and strong things happening. A really far out thing is going to happen. This time is approaching. It is very near. And soon maybe this world will be able to realize who is God, not only believe in Him, but know God exists." Guru Maharaj Ji then flew to Saanemoser, a village 6,000 feet up in the Swiss Alps, where in August 2,000 disciples gathered to attend a festival held in Maharaj Ji's honor. Guru Maharaj Ji outlined the mechanics of devotion. "When Satguru gives the devotee this Knowledge," he said, "it echoes in the devotee, it comes back. And when love is given by a devotee to the Satguru, it vibrates, it glows, it echoes, it comes back much clearer and much more beautifully." After this festival Guru Maharaj Ji again toured major U.S. cities and many more thousands received Knowledge. Then Maharaj Ji flew to Japan and Australia before returning to India. Again he invited the premies outside of India to come and live with him and participate in the annual Hans Jayanti Festival which take takes place in Delhi to honor Shri Maharaj Ji. This time seven jumbo jets were needed to, bring his devotees to India. At the festival in Delhi Guru Maharaj Ji proclaimed, believe that now the time has come for the earthquake to take place. I believe that the whole earth is shaking, because I know that a mountain has to pop up, a mountain of peace has to pop up now. And the mountain of illusion and darkness has to go down. It is shaking quite hard and soon it will go down, it will sink!" In mid 1973 Guru Maharaj Ji again flew out of India to commence his third world peace tour. This began with an immense three day festival in Alexandra Palace, London's largest indoor amphitheater. 20,000 people packed into the building to hear Guru Maharaj Ji and members of his family speak. On the first day Guru Maharaj Ji declared, "As a matter of fact, I am the Perfect Master, because I can reveal peace to people. On the second day he said, "I just ask one favor of you. I don't ask for money, I don't ask you to believe anything I say. I just ask one small favor. Realize God, will you? That's all. This world has to realize God. Because He is beautiful, He is fantastic, He is within you." From London Guru Maharaj Ji flew to the U.S. where he spoke to capacity crowds in New York, Boston, Detroit and Chicago. And now it is time for Millennium '73 at the Houston Astrodome, where Guru Maharaj Ji will bring up the mountain of peace and raise mankind to a new plane of existence!